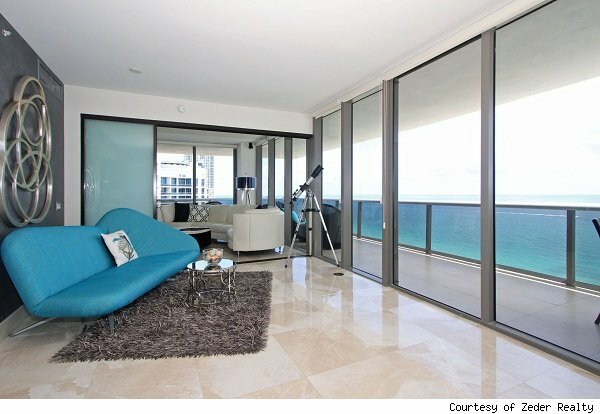 Many investors have Miami Beach in their sights, so we thought we’d do a little bargain-hunting ourselves. We turned up this uber-sophisticated 20th-floor condo on Miami Beach’s Millionaires’ Row with a price tag of $1.2 million. At the market’s peak, it would have been listed at least 30 percent more. The two-bedroom, two-bath unit was built in 2008, a year that will likely go down in Florida real estate annuals as the year they wished never happened. But as a result of the housing market crash, there’s this 1,322-square-foot marbled-floor gem with ocean views, glass sliding interior doors that replace room partitions, and loaded up with designer fixtures and appliances. The kitchen has glass counter-tops and top-of-the-line everything. And the master suite has a heated Neorest toilet, spa tub and a rain shower. The unit is in Mei, an Asian-influenced building. It’s located on 175 feet of beachfront and the building is covered in shimmering glass, surrounded by flowing water. Amenities include a lagoon pool, 24-hour concierge, valet parking, tea lounge, Zen library, spa, yoga studio, and a state-of-the-art fitness facility with private massage rooms. Judy Zeder at The Zeder Team has the listing.